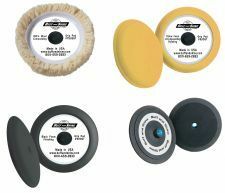 Buff and Shine 8" Tri-Pack Buffing Kit includes three pads and a backing plate. The three pads are #752R for heavy compounding, #830WR for polishing and #820WR for finishing along with our grip backing plate #658Y. The three pads have our patented Center Tee for fast easy pad loading and centering every time. The TRI PAC BUFF KITS were designed for the body shop technician in mind. The different kits were designed to keep a simple set of pads in the shop for the technician and speed up the return of the vehicle to the owner. Each kit has the necessary pads needed in a body shop after a vehicle is painted and color sanded which will eliminate cross contamination.